In trying to use all 15 of RM's color codes in Color Coding by Consanguinity Degree, I found that it was difficult to discern the difference between some colors; how to know which was which. Based on the names in the color code list, you would think they would be fairly distinct but the RootsMagic developers actually use desaturated versions or pastels which narrow the differences. In some cases, the name better fits the result for another color. And on screen font colours do not always match the fill colours on charts. For example, the Red, Green, Blue values for chart "red" are 255,128,128 instead of 255,0,0. Chart "Purple" (254,46,218) looks more like the standard Fuschia (255,0,255) than Purple (128,0,128) while screen font "purple" (170,0,204 at its darkest) is not bad. Even screen font "black" (43,0,0 at its darkest) is not Black (0,0,0). Note that screen fonts are dithered so pixels on either side of the darkest one tend toward washed out pink, orange, blue and gray. On Wall charts, "black" is white while on Box charts it is buff or cream. 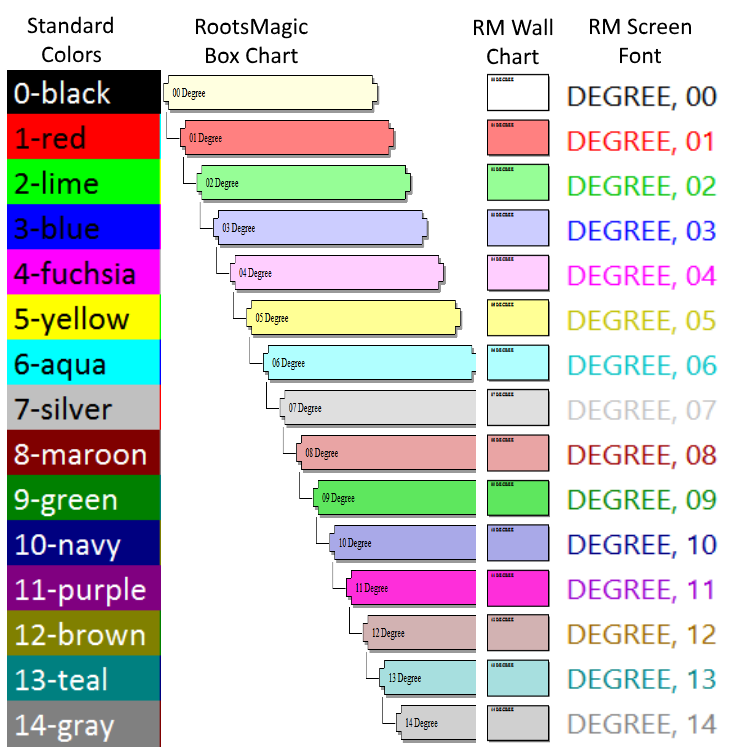 I compiled the following chart of RootsMagic colors showing the RM color number and name on top of the Internet and graphics standard for that color name along with samples from RootsMagic screens, reports and wall charts for comparison. You may find it useful in choosing what colors you would use for your purposes. Edited by TomH, 07 January 2019 - 09:01 PM. I would like to obtain a copy of the color chart, but it has disappeared. Can someone please restore it! I've restored the link. It seems postimages.org has had another hiccup after losing its server domain a year or so back. Now it looks like they have replaced underscores in the file name with hyphens! How many more broken links can there be? I use underscores quite a bit in filenames.